How did you do that. The top picture changes from sepia to color when I run the cursor over it. Magic! Now those are cool doors. Poor little kid looks like he could use a Pepper that’s for sure. Pudgy cheeks,short pants and all alone. Throw in a hot dog while you’re at it. I was probably about that age the first time I had a Dr. Pepper;7 or 8. I thought it was great. I have no clue, Benson. I wonder that myself. Must be the theme? I’ll throw in the hot dog. Well.while you’re at it how about a touch of Jack in that Dr.
Great color juxtaposition with the child and the restaurant. Very cute! So cool – I know that feeling. 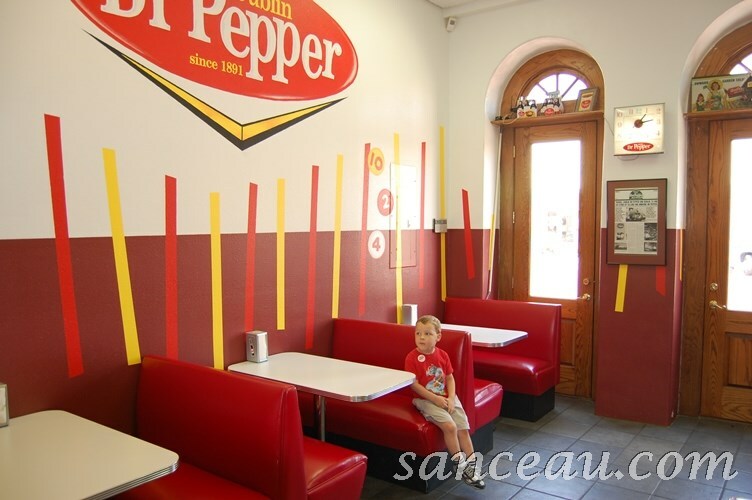 The decorations are amazing – they even have a Dr. Pepper clock and Dr. Pepper over the doorway, the Dr.Pepper colors are even in the upholstery. Amazing to me that Dr. Pepper has been around long enough to have a museum, Kerbey. Great shot! I’m so old.